In the 1950's, club activities were extremely informal. Tom Newton and Ken Ewing recall that the members did some short rock climbs at the Back Rocks above the Northern Area in Los Alamos and made a lot of trips to Colorado. (One popular route in the Back Rocks was Monk's Needle, named for Don Monk. Don and George Bell first climbed this pinnacle in 1953. Don was also on the first ascent of Easy Ridge and the Great Couloir in the Brazos with George and Ginny Bell.) Eiichi Fukushima recalls that he and Larry Campbell climbed Battleship Rock (near Jemez Springs) right on the prow and found it to be an easy rock climb. Fig. 1. 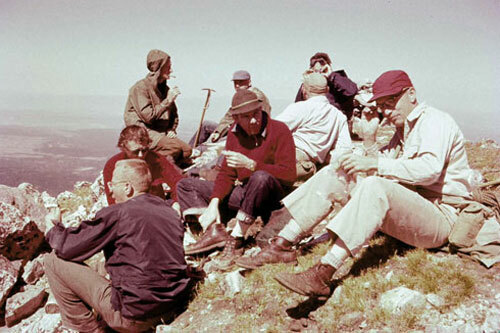 Mountaineers on top of Middle Truchas Peak: Marvin Tinkle, Mrs. Mulford, Tom Stevenson, Bob Mulford (red sweater), Herbert Ungnade (blue cap), two unidentified persons, and Frank Pretzel (Charles Mader photo, September 1955). In the 1950's and 1960's, the club used to have summer outings to major climbing areas. These were two-week trips, but some people would come for just the first or second week. Ken Ewing recalled some anecdotes from these early trips. On a trip to the Wilson Peak and Mt. Wilson area in May 1957, John Ramsay, Ken Ewing, Liz Gittings Marshall, and (maybe) Gene Tate climbed Wilson Peak. Don Hagerman and Harry Hoyt climbed Mt. Wilson. Ken got pulmonary edema for a few hours on Wilson Peak. The others in the party went ahead and came close to getting hit by lightning. Ken could feel the hair rising under his hard hat until a local stroke discharged the field. On a saddle near the Wilsons, there was an old mining hut where they found sticks of frozen dynamite. John Ramsay noticed that the dynamite sticks were exuding liquid, a sign of instability, so he knew that they were dangerous! (John Ramsay photo, May 1957). Ken also recalls trips to the Southern Wind Rivers (Cirque of the Towers) and to the Northern Wind Rivers (where they camped at Island Lake and climbed Gannett Peak via the glacier). On the 1958 trip to the Cirque of the Towers, the group climbed Warbonnet, Pingora (by the standard route), and an Unnamed Peak. John Ramsay remembers that they had to do a very scary rappel at an angle of 45 degrees to get down from Pingora. John had also been to the Cirque of the Towers in 1951 before he moved to Los Alamos. That trip was probably the second climbing trip ever to the Cirque, after the original visit by the Bonneys. There were two early club trips to the Tetons, one in 1953 and one in 1955. Ken climbed the Grand Teton on each trip and did the free rappel using a (padded) dulfersitz technique. They also climbed Mt. Moran via the Skillet Glacier. This was too steep for ice axe self-arrest (60 degrees), so they did ice axe belays all the way up and down. They also climbed the South and Middle Tetons. John Ramsay recalls that he, Don Liska, Wally Green, and others came out from the University of Wisconsin in 1954 to climb several peaks, including the Direct Exum Ridge and the friction pitch route above that. One early club trip was to the High Sierras, where they climbed some of the Minarets, Mt. Ritter, and Banner Peak. In the night, Ken Ewing and Tom Newton saw a bright flash of light and heard what sounded like a big rock fall. Later they learned that this was a 70 kiloton test at the Nevada Test Site. George Bell, Dave Brown, Mike Williams, and Don Liska (all LAMC members) climbed the Kain Face on Mt. Robson in 1968. They were the first climbers to reach Robson's summit that summer. Don Liska and Dave Brown got hit by an avalanche descending the face and had to be rescued by the Canadian Air Force. On the descent, the party had tried to make the slope slide before stepping onto it, but couldn't. Then, part way down, a snow slide came in diagonally from a side gully and caught Don and Dave. Both climbers were injured, Dave quite seriously. Dave remembers that "while cartwheeling down the Kain face, I asked myself, 'Now how do I do a self-arrest in this situation?'" Don says, "On the 600-foot fall, I smashed my Kelty frame into a dozen pieces which must have absorbed a lot of energy as I wasn't more seriously injured. The Kain route is one of the most dangerous I've ever been on. Approach such a climb with extreme caution!!" The party had camped at a good site several miles away from the face for about a week before attempting the face. But from that location they could not observe some of the activity on the face, so they may not have been aware of how frequently snow slides occurred. Don Liska recalls that George Bell pulled off a very gutsy solo walk over the Robson Glacier to turn in the alarm. After the rescue, a Canadian onlooker at the base of the mountain pressed a bottle of whiskey into Don's hand with the comment, "You need this more than I do." In the summer of 1969, club members Eiichi Fukushima and Larry Campbell did a first ascent of the steep south face of Little Annapurna Peak in the Eastern Cascades. This peak is located in the Enchantment Lakes region, near Mt. Stuart. The climb is now described in Fred Beckey's guidebook for that region. Both the rainy west side and the drier east side of the North Cascades have been the destination of several club trips and other private trips by club members over the years. By the late 1960's and early 1970's the club had grown to about 50 or 60 members and offered trip schedules featuring a wide range of summer and winter activities. Summer trips included many climbs of Colorado Fourteeners and rock climbing trips to places such as the Brazos Cliffs, Black Canyon of the Gunnison, or the Organ Mountains. There were typically one or two annual week-long trips to farther destinations. George Bell, Don Liska, and others led two club trips to the Tetons, in 1967 and 1968. 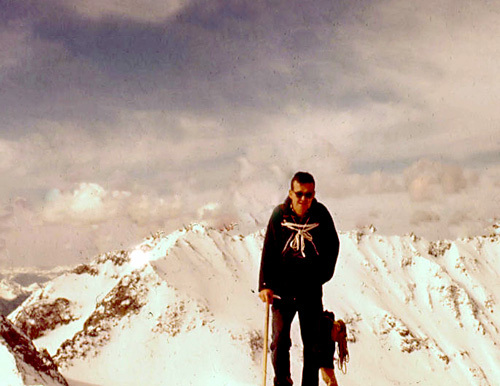 Winter trips in the 1972-1973 season included ascents of Lincoln, Bross, and Democrat led by Ken Ewing; an ascent of Kit Carson led by Mario Schillaci; a climb of Santa Fe Baldy led by Larry Dauelsberg; and trips to the Pecos Wilderness and San Pedro Parks. For a few years the club issued a newsletter that listed upcoming trips and included short articles on conservation or mountaineering issues. The March 1972 issue of "Trail and Timberline," the Colorado Mountain Club's publication, was devoted to the "Los Alamos Group," as it was called by the CMC. Larry Campbell, the club's President that year, coordinated the writing and collection of photos for the issue. The Brazos Cliffs were shown in the cover picture and George Bell's article on the Brazos (as described in the Brazos section of this history) was the lead article. Bill Hendry provided an article on the 1971 Los Alamos expedition to Mt. Waddington and Larry Campbell wrote one on the 1971 Greenland expedition. The 1970's and 1980's were the years of greatest activity for the Mountaineers, with typically 8 to 12 winter trips and 15 to 25 summer trips every year. In the summer there was usually a scheduled trip every weekend or at least every second weekend. Some weekends featured both a technical climb and a family hiking trip. The club also conducted search and rescue practice sessions, participated in some conservation work, and occasionally hosted a rock climbing film festival. Pamirs 1987 (successful high climb, sickness, and HAPE). Some of the above expeditions are described elsewhere in this history, as noted. Also Don Liska is providing detailed trip reports for some of these expeditions (see links above). Some of the club's senior members were also members of the American Alpine Club, including George Bell, Don Liska, Eiichi Fukushima, Larry Dauelsberg, Larry Campbell, and Len Margolin. Don Liska also initiated several trips to the Mexican volcanos, which were all virgin territory for the Mountaineers. At Christmas time in 1967, Don and Alice Liska and Dave and Faye Brown went to Mexico to enjoy the holiday season and climb Popocatepl and Ixtaccihuatl. Don wrote an unpublished article in 1971 on "Climbing the Three Mexican Volcanos." And, in 1978, Herb Kincey wrote an article on "Climbing Mexico's Big Three Volcanos" for the February-March issue of Summit magazine. These articles provided travel information, contact names, approach maps, and descriptions of the major routes on the three volcanoes, which encouraged other club members to climb the volcanoes. In the early 1970's, Larry Campbell, Carroll Mills, and other mountaineers joined Don on several trips to climb Popocatepl, Ixtaccihuatl, and Orizaba. Larry and Carroll also returned to Ixtaccihuatl by themselves, as they didn't climb all the way to the summit on Don's trip. Ross Harder led a Mexico volcanoes trip at Christmastime 1972, and Merle Wheeler led one in February 1979. 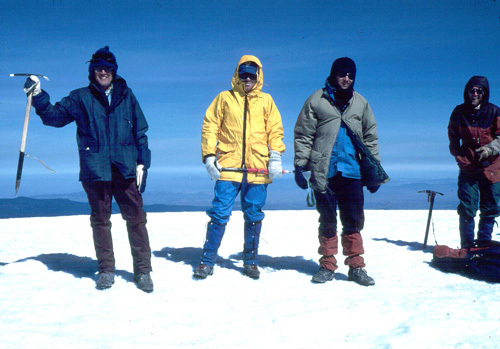 Bob Cowan, Ken Ewing, and other club members climbed some of the volcanos in 1980, 1981, and 1982. A 1982 Mountaineers trip to the Mexican volcanos provided the photo shown below. Ken Ewing also recalls a second successful climb of Popocatepetl in 1984 with Roland Pettitt and a United Church group. More recently, in November 1998, Mike Sullivan climbed Orizaba and Ixtaccihuatl. That was the year Popocatepl was closed because of eruptions. (Bob Cowan photo, January 1982). Don Liska and Larry Campbell led a Mountaineers' trip to Baja California to climb Picacho del Diablo in 1973. Don says that "This was a fine trip. It had Gerry Roach on it. Roach later became a well known name in hard-core climbing and authored a guide to the Colorado Mountains. On our way in we encountered a 'bolt ladder'--namely a carpenter's ladder slung from a bolt on the granite wall above the big waterfall. On this trip Carroll Mills decided he would survive the 5-day climb on 10 pounds of roasted soy beans and water. Fortunately, there were a couple of excellent gourmet climbers on the trip so Carroll was not overly tested. The climb was successful." During the 1980's, the Club organized some caving trips to southern New Mexico. There are many small caves in the Guadalupe Mountains near Carlsbad Caverns National Park. Access to these caves was obtained by permit from the Lincoln National Forest, and for some caves it was necessary to unlock gates inside the caverns to get access to the best areas. On these trips club members had the opportunity to practice some important mountaineering skills in the dark: such as jumaring or rappelling past a knot in the rope, or jumaring up through a hole only large enough to squeeze through if you exhaled! During those years Club members also organized a series of "gourmet backpacks." These were short-distance backpacks that concentrated on carrying in a large quantity of food and drink! The first gourmet backpack was held at the Rio Grande below White Rock, and organized by Jan Iversen in 1978. Jan also organized gourmet backpacks in 1979, 1980, and 1981. A 1982 gourmet backpack in the Jemez River Canyon in 1982, led by Len Margolin and Chris Foster, had several problems with minor accidents caused by drunkenness. The next year Lynn Sherman (now Ensslin) and Jenni Sprinkle led a return trip to this area, but it was a very calm family affair, a strong contrast to the previous year! Many club members have always enjoyed bicycle riding for exercise and for the opportunity to do extended outings in Northern New Mexico. In 1973 the club issued a list of 20 recommended bike trips, including the newly-discovered White Rock loop (27 miles), and the Los Alamos to Aspen ride (300 miles one way!). Don Gettemy and Gracia Coffin led several club mountain biking trips to the Wheeler Geologic Area and to Penitente Canyon in southern Colorado. In the 1980's two club members, Keith Gainer and Gabriela Lopez-Escobedo, spun off a new club, the "Tuff Riders" Mountain Biking Club. Many members of the Mountaineers also belong to that club and continue to share a common interest in mountain biking.